Many of the cloud-syncing services out there, such as Dropbox, sync across all your computers and devices any data you place in a specific, special folder on your Mac’s drive. This approach makes these services dead-simple to use. But as we’ve covered elsewhere, you can sync almost any folder on your drive through creative use of Unix symbolic links (which are similar to OS X’s aliases)—assuming you know how to create them, or don’t mind the hassle of doing so. MacDropAny does all this legwork (or fingerwork, if you will) for you. 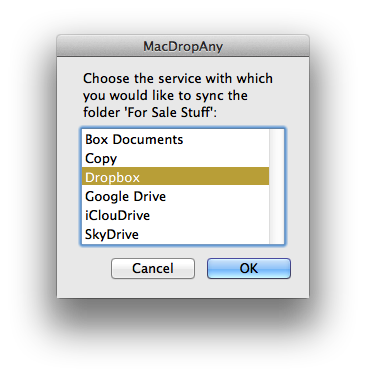 Open a folder in MacDropAny—either by dropping the folder onto the utility’s icon, by launching the utility and using its Open dialog box to select the folder, or by selecting the desired folder in the Finder and then using the new Sync Via MacDropAny option in the Finder’s Services menu—and you get a dialog asking which sync service you want to use: Box, Copy, Dropbox, Google Drive, iClouDrive (the developer’s app for using iCloud for syncing files and folders), or SkyDrive. Choose a service and click OK; choose where in your service’s sync folder you want the link to go; and choose a name for the link, and MacDropAny creates the appropriate symbolic link in the necessary location—your data will begin syncing to the chosen service immediately (provided you have an active Internet connection, of course). The developer’s website provides instructions for keeping a folder in sync between multiple computers, even if that folder resides outside your sync service’s special folder on any computer. MacDropAny doesn’t do anything you couldn't do on your own...assuming you knew the right Terminal commands and felt comfortable using them. But that’s the case for many system tweaks in OS X. MacDropAny is simple, free alternative that anyone can use. 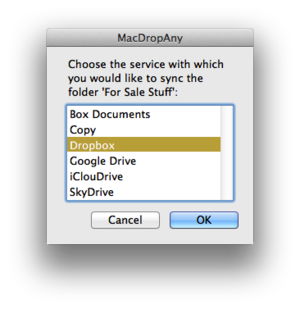 MacDropAny lets you sync any folder on your Mac using Dropbox, Box.com, Copy, Google Drive, iClouDrive, or Microsoft SkyDrive.